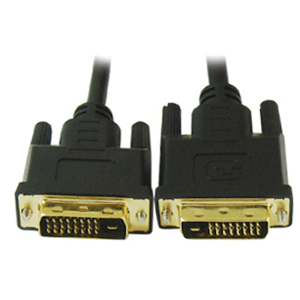 Digital Visual Interface (DVI) is the standard interface for a high-performance connection between PCs and flat panel displays, digital CRT displays, projectors, and HDTV. These precision-engineered cables are fully compliant with the DVI standard defined by DDWG (Digital Display Working Group). The DVD-D dual link configuration provides enough bandwidth for resolutions up to 1920 x 1200 and allows high speed digital transmission up to 9.9 Gbps.